His eye-witness reports of bullfights are particularly good. 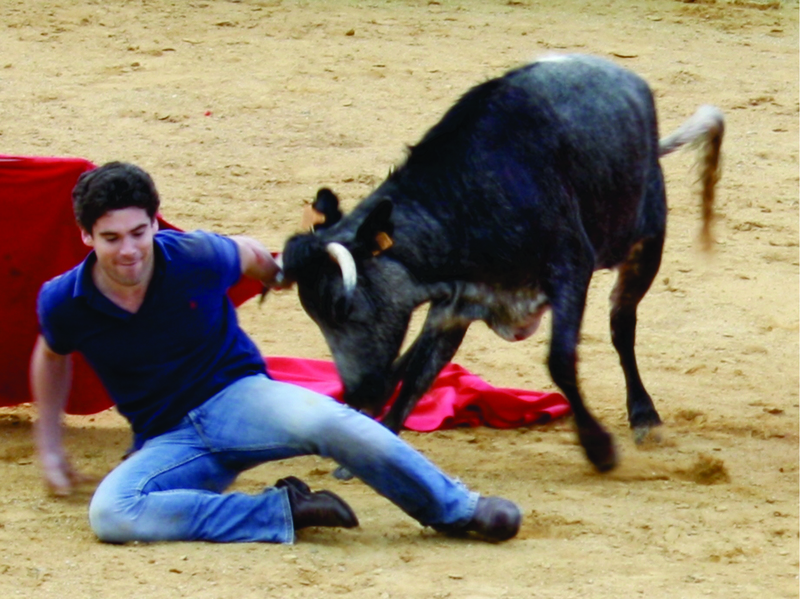 He transposes the spectacle into words with great success, conveying the drama of the corrida while explaining individual moves and techniques with eloquence and precision. One bull is ‘a paranoia of horn and muscle’. He is also knowledgeable about the different breeds of bull, some more deadly than others, and the great families whose names are synonymous with breeding bulls and fighting them. I didn’t know that bulls bred to fight never see a person on foot – only ever mounted – until they are in the arena. Bullfights in Seville are preceded by an announcement: ‘Silence! A man risks his life here today.’ I didn’t know that Orson Welles had trained as a bullfighter in Seville for four months under the name El Americano, or that the sport nowadays turns over 2.5 billion euros a year and employs 200,000 people for 2,000 fights. That’s a threefold increase since Hemingway’s time. And it’s strangely heartening to know that if you walk past a policeman in Seville carrying a half-concealed sword he will just smile and cry ‘torero!’. Outside the arena Fiske-Harrison is less sure-footed. His conversations with off-duty bullfighters rarely get further than the ‘why do you do it?’ stage and seem to take place at social functions where it is hard to establish any intimacy. I wanted to know about these men’s homes, their families, their priests and the surgeons who patch them up time and again (many bullfighters have only one testicle apparently). We learn that a Madrid psychiatrist has found that the brains of bullfighters exhibit a similar neurochemical balance to those of prisoners classified as clinical psychopaths. Are bullfighters psychopaths then? It would be interesting to learn more. In these days of growing concern at the methods of factory farming and the welfare of the animals which are raised and killed for our consumption, it is instructive to compare the life of domestic beef cattle with that of a Spanish fighting bull. The cattle may have less than two years of life in cramped conditions, while the toro bravo roams free and unmolested on pasture for five years. Alexander Fiske- Harrison makes the comparison succinctly: ‘Five years on free-release and then the arena, or 18 months in prison and then the electric chair’. He maintains (there is some evidence for this, to do with beta-endorphins) that the fighting bull’s suffering is reduced because, once in the ring, it feels no fear, only aggressive anger. Ban the bullfight and this magnificent breed of animal would cease to exist. It is not a good converter of grass into protein, and anyway far too dangerous to be bred only for meat and milk. The case for what in Spain is called la corrida de toros is well made in this entertaining account of two years which the author spent in Spain — following the bulls, caping young cows himself, getting to know matadors, attending ferias and flamenco parties. An initially reluctant convert to this Spanish cultural tradition, he comes to accept that ‘part of the justification of the suffering is the art’. When- ever he sees a bad and bloody corrida, however, his doubts over the cruelty surface again. Every aficionado has seen fights which are both shameful and plain boring. But when everything goes right, the spectacle can be absorbing, uplifting, even emotional. What Fiske-Harrison seeks, as someone wrote of the great torero Antonio Ordoñez, is ‘a demonstration of the values which distinguish bullfighting from butchery’. Those values are concerned with technique, artistry, grace under pressure from a highly dangerous animal which is doing its best to kill its adversaries. In conversation with one of Ordoñez’s matador grandsons, Cayetano, the author learns of ‘the warmth a great bull could inspire in him, of his sadness at killing’. Having returned to Oxford and read books on animal rights, he decides, that he must go back to Spain and kill a bull himself. Coached by a former matador, Dávila Miura, Fiske-Harrison proves himself brave and competent enough to reach what the Spanish call la hora de la verdad, the moment of truth, when he puts his bull to the sword and gains some understanding of what Cayetano had told him. Among the principal toreros of today, Fiske-Harrison gives brief mention to the two — Enrique Ponce and El Juli — who have dominated the scene for the past decade, and the faintest praise to José Maria Manzanares, who has emerged recently as both a consummate artist and master swordsman. One of the book’s best passages — which bears comparison with Kenneth Tynan’s outstanding book, Bull Fever — is the description of a performance by the controversial José Tomás in Jerez. This so-called phenomenon, or suicidal lunatic, having lost 17 pints of blood from a horrible goring in Aguascalientes, Mexico last year, is due to make his comeback in Valencia next month.